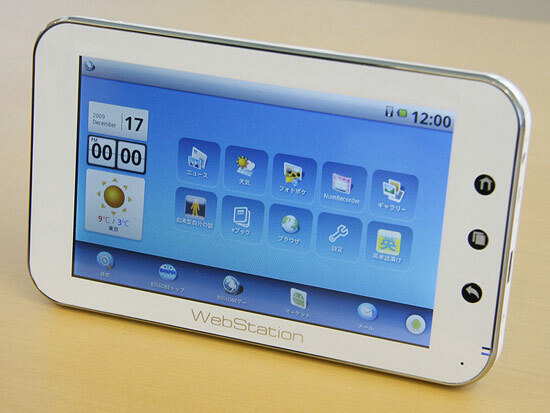 NEC Biglobe announces several Android web tablet style devices for Japan release coming in early 2010. The Camangi beta model, photo below, comes at estimated sale price of 30,000 JPY, or approx. $330. The unit has microSD, WLAN with no operator voice/data plan required and 4-5hr battery run-time. For more details on the upcoming so-called “Cloud Device” produced by NEC see this post in English – by Tech-On. NEC BIGLOBE announced that they put the net terminal that adopted OS”Android” for a mobile terminal of the U.S. Google on the market in 2010 on December 17, 2009. The application etc. for Android besides the sending and receiving of the inspection of Web and mail can be used. The price turns on the terminal made by NEC that improves the video reproduction ability by scheduling about 30,000 yen in 2010. Application delivery service for the terminal “Andronavi (andro Nabis)” begins on January 7 next year, too. It aims at sales of 10 billion yen fiscal year 2012 year in the commission etc. of sales and the connection service of the terminal and the application. The marketing research is executed with a terminal made of Camangi of a Taiwanese manufacturer next February, and feedback from the user is reflected in the product. Andro Nabis is scheduled to arrange 100,000 applications by the end of fiscal year 2012. It is thought that it aims at the user’s acquisition by service that combines hardness and software. It is an advantage to omit the telephone call function, and not to take the time of the contract though it competes with a multifunctional cellular phone at the personal computer level such as smart phones “iPhone” of Apple and “Windows phone” of Microsoft. Android of an open platform was adopted and the terminal cost was reduced. The feature in a new terminal is to have the easiness of the screen of the personal computer to see and the easiness of the cellular phone. It provides with the display of seven inches, and the screen is operated touching directly by the finger. Wireless LAN is built into, and it corresponds to 3G/WiMAX etc.As for 3G/WiMAX, [i-mobairu] and UQ WiMAX by which this company offers the connection service as MVNO now are scheduled to be adopted. Making to following [hakakakinsei] of two stage fixed amount enables the fee system to pay only the amount used outside. In the terminal made of Camangi, it is a feature that 14.5mm in thickness and cabinets are slim. The stand of the sucker type is attached, and the direction is set up. The angle of the screen can be adjusted. Resolutions on the display are 800×480 dots. It is almost the same resolution as the cellular phone. The battery drive time for 4-5 hours. Storage uses microSD. “BIGLOBE gate” etc. that share Web E-mail “[Weburime-ru]” of this company, photograph common service “[Fotopoke]“, and the favorite, etc. on online are customized for the net terminal and the application is offered. The service of information on the other companies offer like the weather and the recipe, etc. is prepared. It is said that it will make efforts to contents of the entertainment systems of the game, the digital book, and animation, etc. If it is the one developed for “Android Market”, it transplants it comparatively easily. It is enthusiastic, president Hisao Iizuka “It wants to make the best use of the knowhow of the contents offer with the contents partner who cultivated it as ISP and to offer the unique one” of NEC BIGLOBE. It is an idea to demonstrate the strong point that has worked on the contents delivery service up to now in cooperation with the partner enterprise. There are a lot of one of the application that operates on that that the one for the personal computer was replaced with iPhone though it is when the difference is typed out by the size of the screen. It is said, “Search for the application that it will be accepted by the user in the future” ([kan;yoshiyuki] managing director of old of this company).